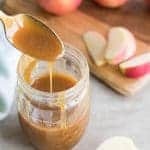 This delicious Vegan Salted Caramel Sauce uses only 3 ingredients and takes about 5 minutes to make. While I won’t claim it’s healthy, it’s definitely a healthier option for when you want to splurge! 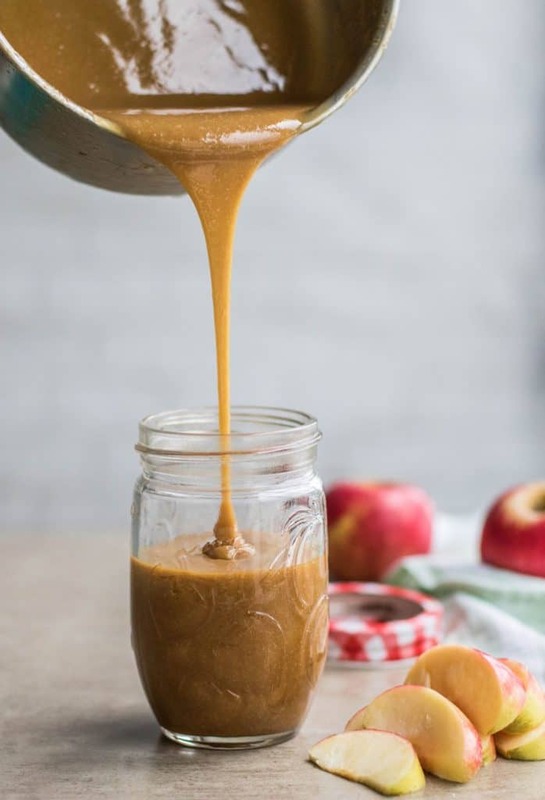 This Vegan Salted Caramel Sauce started out as just a topping on a recipe I am posting soon, but it turned out so good, I had to highlight it as it’s own recipe! 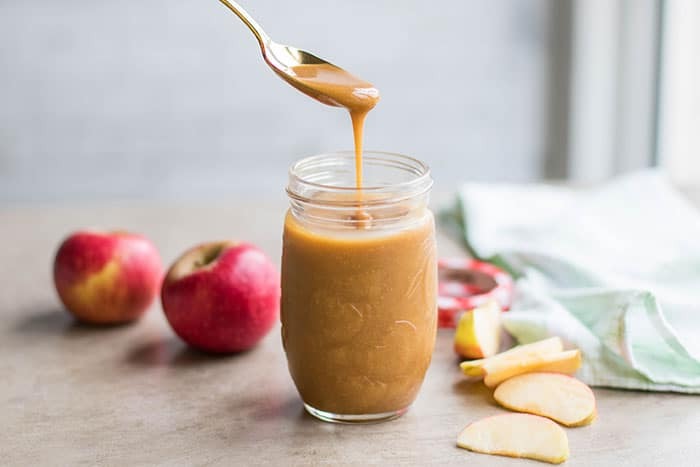 I have to give credit to my inspiration- Regina’s Vegan Caramel Sauce from her beautiful clean-eating blog, Leelalicious. Her’s uses coconut sugar, and I am sure is wonderful! 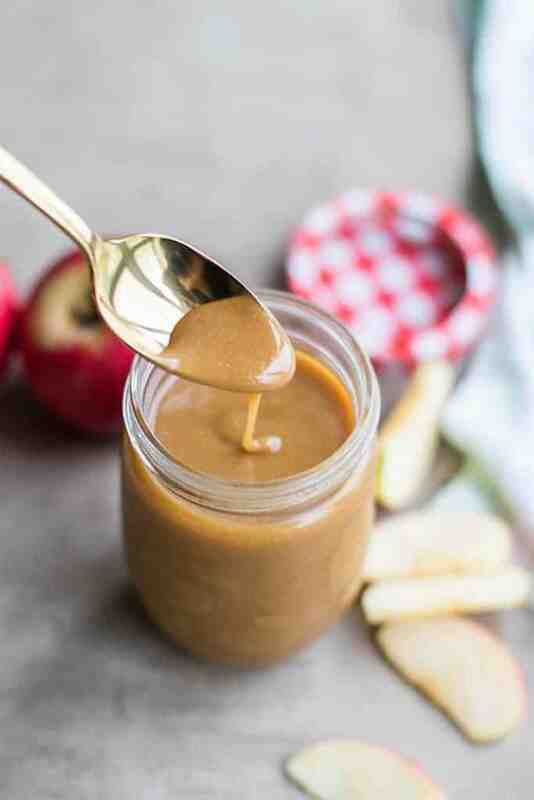 When first thinking about making a healthier caramel, I thought I would just mix cashew butter and date syrup together, heat it a bit, and drizzle it on. I tried it, but it was too-cashewy for what I had in mind. After stumbling across Regina’s easy caramel sauce recipe, I knew coconut cream was the answer (coconut cream is the answer to MANY of life’s little problems). 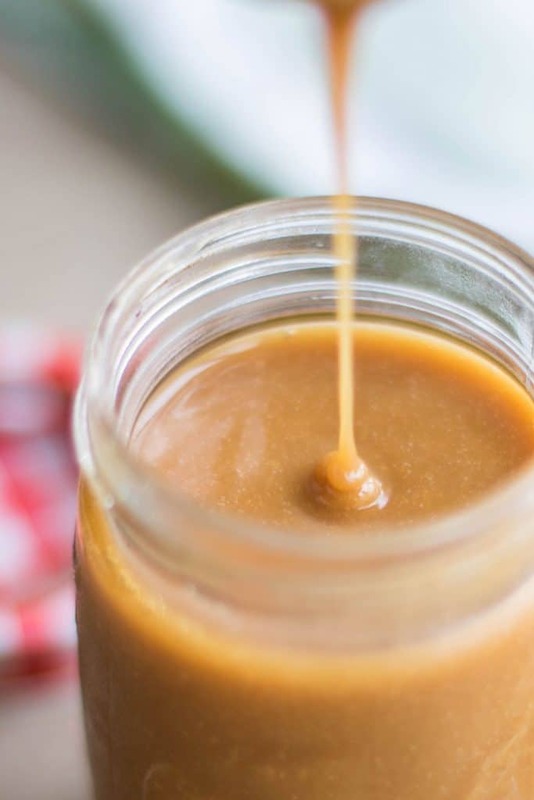 So many uses for this delicious and rich coconut milk caramel sauce! — apple dip, frozen yogurt topping, drizzle onto cakes and pies — but for those things to happen, it has to last in my refrigerator a few days (my spoon made it’s way into the jar a few too many times last night). You can buy coconut cream at many stores now– it’s also available on Amazon. It is different than coconut milk – less water, condensed. I tested this using full fat coconut milk instead of coconut cream, and it still works. If you make this swap, just be aware that it will take about twice as long to boil down enough to make a thick sauce. Make it Paleo: I am not sure if date syrup is considered Paleo or not– so if you strictly adhere to Paleo, honey will work in this recipe as well. This rich and buttery sauce is made with just 3 ingredients, and comes together in about 5 minutes. The perfect apple dip, or drizzle on top of frozen yogurt, cakes or pies. This recipe is adapted from Leelalicious' Vegan Caramel Sauce. Add all 3 ingredients into a saucepan. Bring to a low boil over medium heat. Whisk the ingredients together about every minute. After about 5 minutes, drop a small amount of the sauce into a glass of cold water. If the sauce turns into a cloud, the sauce will be very thin. Retest the sauce every minute or so until the sauce turns into a small ball when dropped into the ice cold water. Depending on the temperature of your stove, this should take between 5-10 minutes. If subbing coconut milk (rather than using coconut cream), this process will take longer. I also found that the mixture foamed more while I am cooking it, so I needed to turn it down a bit more. It doesn't get quite as thick as the sauce made with coconut cream, but we still really enjoyed it. Vegan AND free of refined sugar?! This recipe is amazing! This would go perfect with overnight oats! Wish I could buy date syrup around here. Where do you live Julia? I live in Asia part of the year and it's much more available here than in the States-- but now you can buy it at Whole Foods and on Amazon in the States. Honey works in place if you can't find it though! Love that it is free of refined sugar, although I am such a huge cashew fan I'm left curious about your first attempt! :) Will still give this a try as it looks and sounds delicious. Looks amazing, I can't believe it's vegan! I can almost taste this incredible coconut- date caramel just by looking at your yummy photos! It is delicious. And a bit dangerous to have in the fridge! 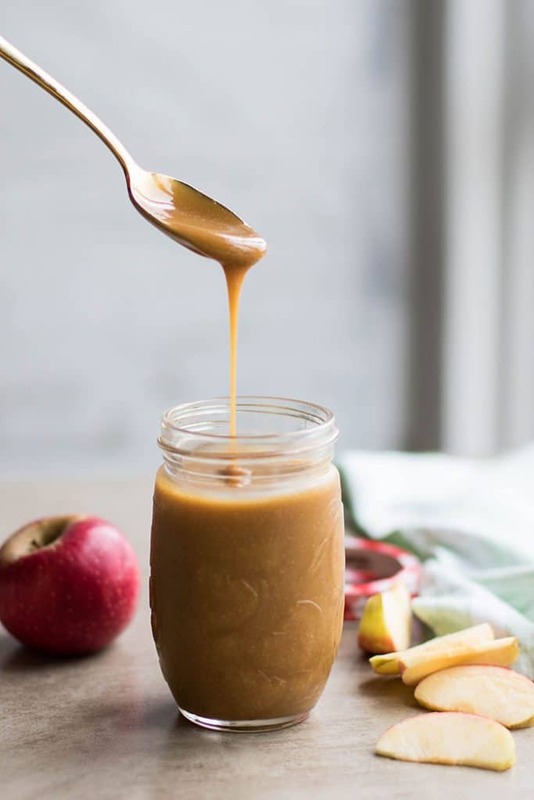 I love this, I've never made my own caramel sauce before so I can't wait to try this! I had never made a caramel sauce before either -- it's so easy, and so worth it! That's quite brilliant! I would have never come up with the idea of using date syrup to make a vegan caramel. That recipe should be in a cookbook! Thank for sharing! Thank you Helene! It certainly is already a favorite here. I love salted caramel sauce, I can't believe this is vegan! !